Painting of two Iris blossoms on a purple panel at the left edge of the card with a white lettering panel at the right. Rings united in a cross with yellow roses. 5" by 7". 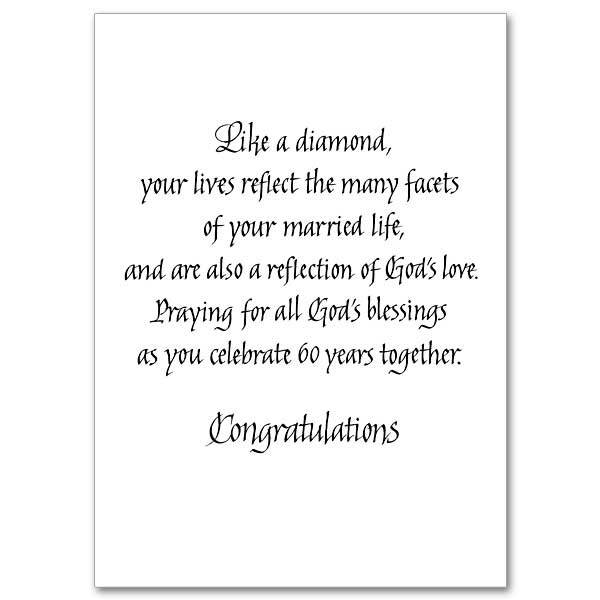 Help your friends and relatives celebrate any wedding anniversary with this card featuring a bouquet of pink roses with wedding rings tied to ribbon. Card size is 4 3/8" x 6". Heart of flowers with blue cross and text overlay. Gold-foil embossed. 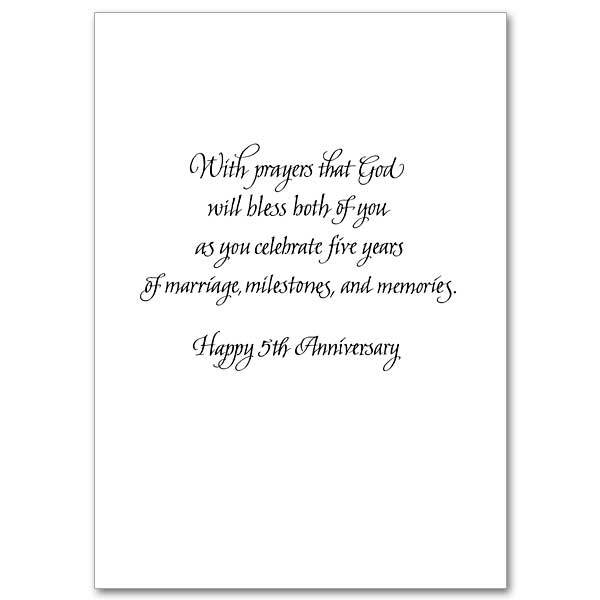 Rejoice with those celebrating their golden wedding anniversary. 5 1/2" by 8" extra. Gold floral background with calligraphy and bells. Two candles united in a cross, against a stained glass window. 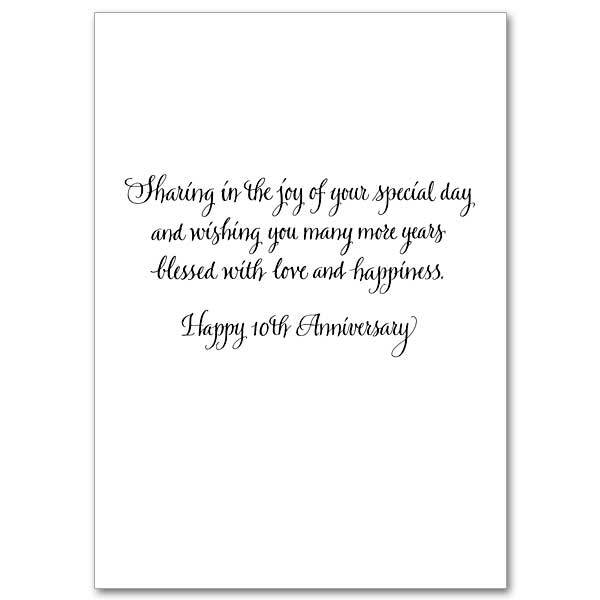 Rejoice with those celebrating wedding anniversaries. 5" by 7". 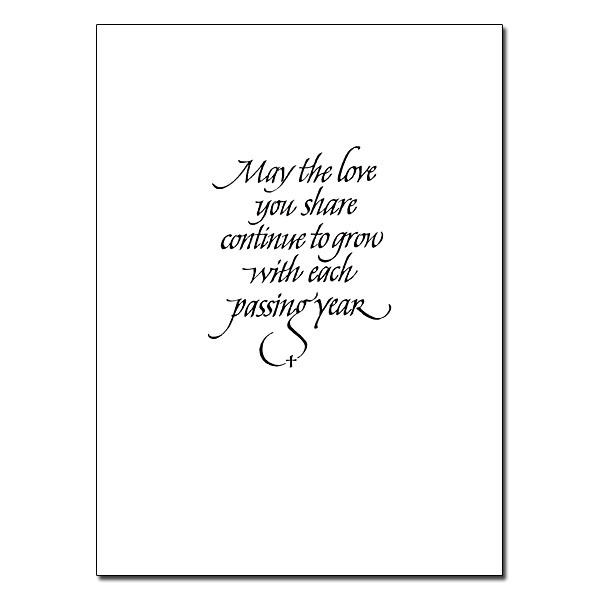 Rejoice with those celebrating their wedding anniversaries. The cards measure 5.93" by 4.38". colored pencil drawing of a blue cross with interlocking golden rings on a light orange/golden background. 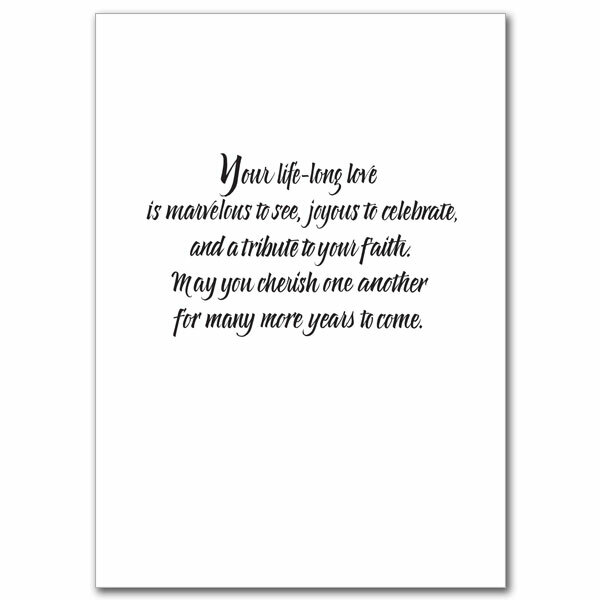 Rejoice with those celebrating wedding anniversaries. 5" by 7". 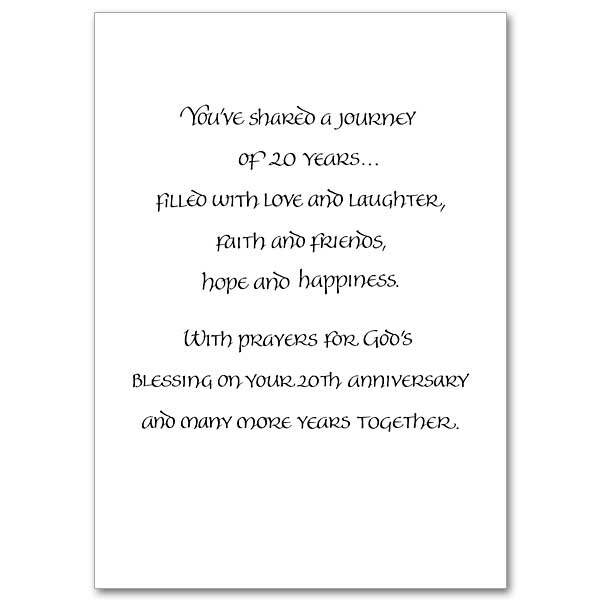 (Die cut, foil embossed with foil-lined envelope) Rejoice with those celebrating anniversaries of every kind. 5 1/2" by 8" extra. 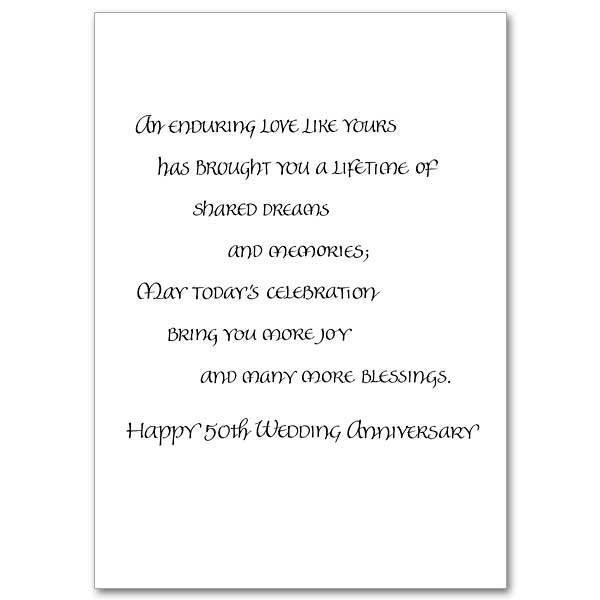 Foil embossed with foil-lined envelope) Rejoice with those celebrating wedding anniversaries. 5 1/2" by 8" (die-cut) extra. 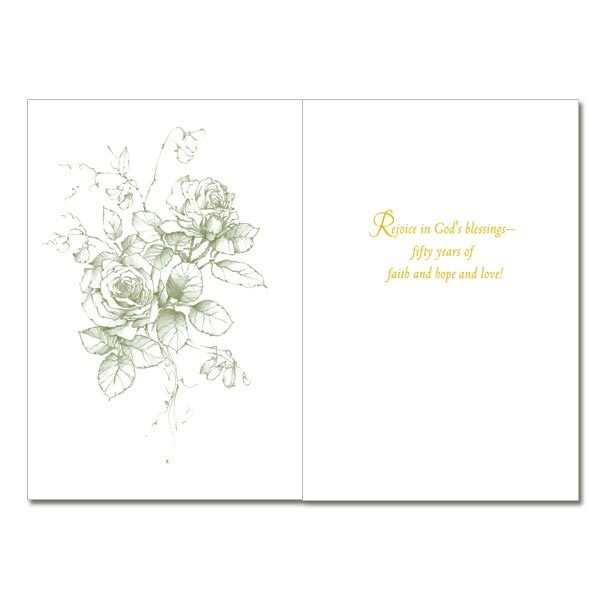 Gold floral background with calligraphy and roses. Blue floral background with calligraphy and roses. Red floral background with calligraphy and foiled rings. Two hearts joined together with stylized branch and chi rho. Painting of a bouquet of red roses with the text in gold calligraphy. 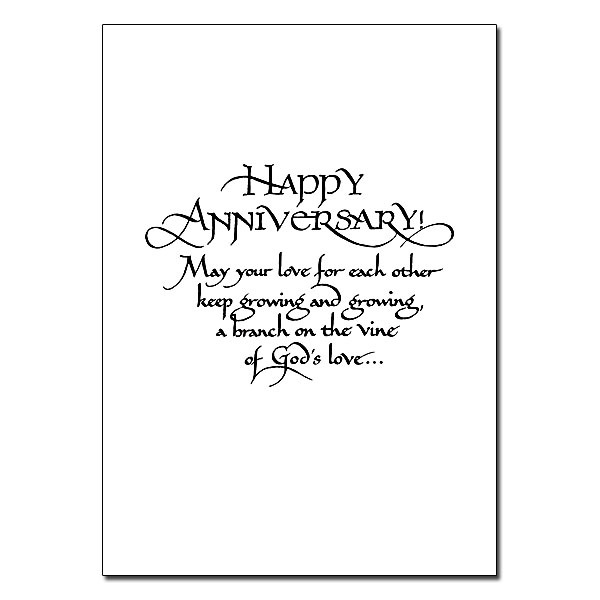 Rejoice with those celebrating their wedding anniversaries. Gold stamped. This card was formerly CA0801. Delicate bouquet of white flowers and green foliage with a background of strokes of light purple. A border of flowers and a central cross in foil is seen at the top of the image with a similar border at the bottom. Teal floral pattern with calligraphy and birds. Purple floral background with birds and foiled calligraphy. "25 Years" frame holds a 4" x 6" photo. 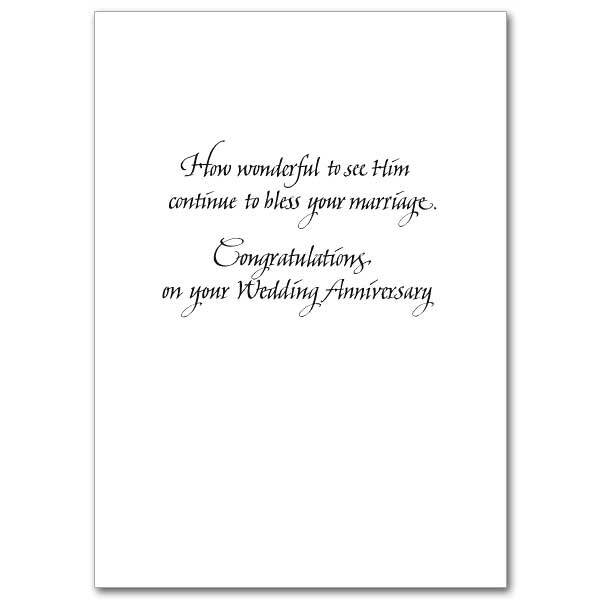 Perfect for that special Anniversary photo! White pearlized ceramic frame with silver-toned silk-screened accents. Size: 8" x 6"
Lettering in upper quadrant with peach watercolor ground; three-beamed cross in foil with joined rings on a blue watercolor ground. Image of two trees intertwined. The trees are filled with hearts and dots in red foil. The text is in white on a solid red foil background. 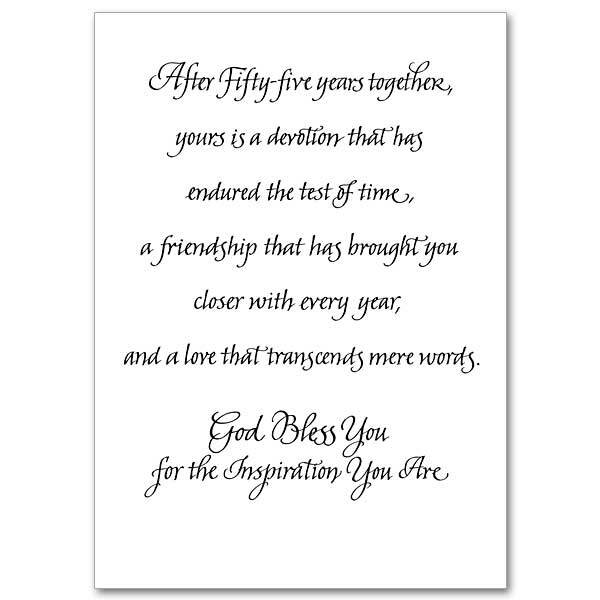 The background of the card is white. Teal floral background with calligraphy and rings. 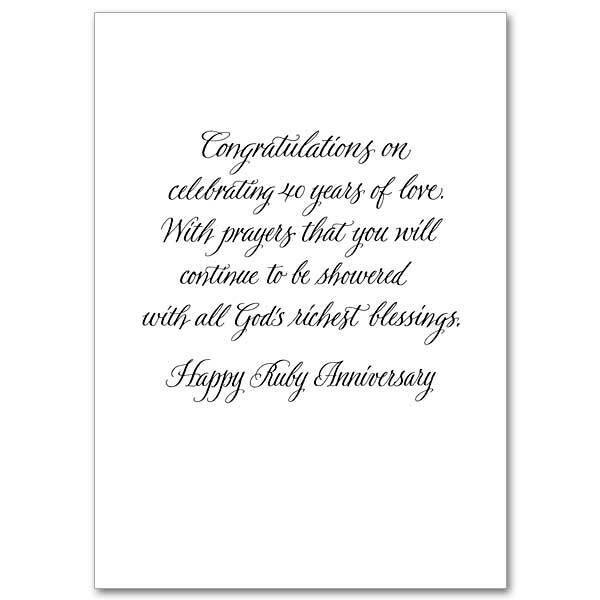 Silver foil embossed Rejoice with those celebrating their silver wedding anniversary. 5 1/2" by 8" extra. 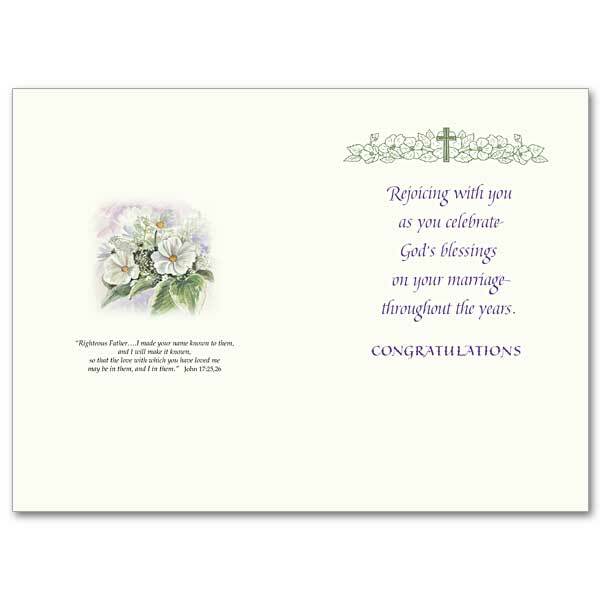 Help your friends and relatives celebrate their 50th wedding anniversary with this card featuring a cross with rings with purple Celtic border. 5" x 7" gold foiled stamped card. (Silver-stamped) Printed on recycled paper with post-consumer fiber. 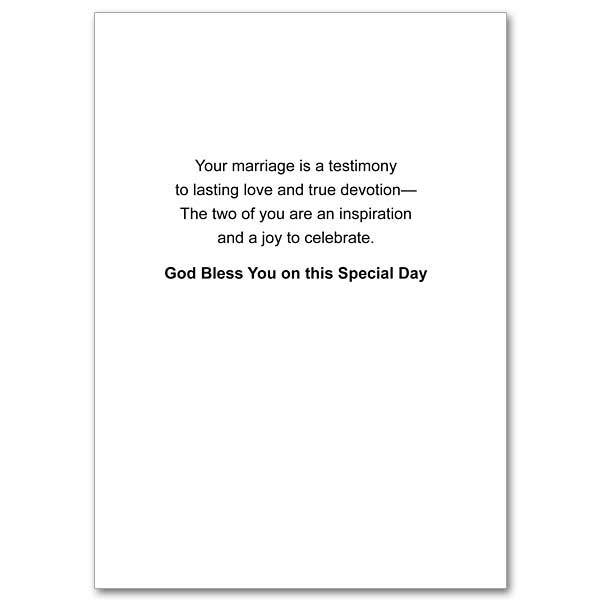 Matching envelope. Deluxe 5 x 7 inch size.